Summary: In an unforgettable new novel from award-winning authors Jason Reynolds and Brendan Kiely, two teens—one black, one white—grapple with the repercussions of a single violent act that leaves their school, their community, and, ultimately, the country bitterly divided by racial tension. Review: First off, let me share this tweet I wrote when I first began reading All American Boys. Just finished first chapter of @JasonReynolds83 All American Boys and am trying not to cry on the train. No lie, I was sitting on a crowded train, heading into Downtown Los Angeles and I totally wanted to cry. Chills ran up and down my spine as I read the first chapter and when I got to the last 3 words on the page, I was a mess. I wanted to grab Rashad, my nephew, my godson, all of my former male students and hold onto them for dear life, then put them in a room where they would be safe and away from potentially dangerous interactions with the police. Mama Bear came out and she was ready to fight for her youngins’, but alas, I was on a train, so I took a deep breath in, fought those tears, placed the book on my lap, and stared out the window to compose myself. The opening was just that intense and then didn’t let up for the rest of the novel. I had intended to read the novel slowly, to really digest Jason’s & Brendon’s words, but I got too caught up in the story, in Rashad’s and Quinn’s words, their thoughts, their feelings, that I ended up forgoing sleep to finish the book. And when I reached the end, this time I let the tears fall. I allowed myself to stay in the power of the moment, of the emotion of the two boys, of Quinn’s journey and Rashad’s first steps towards healing. I allowed myself to linger in the knowledge that I had read one of the most powerful books of our time and one that I believe will be considered a classic. A book that will be taught in classrooms (including mine) and talked about in all types of literary circles, and is the perfect example of how reading forces us to become more empathetic. 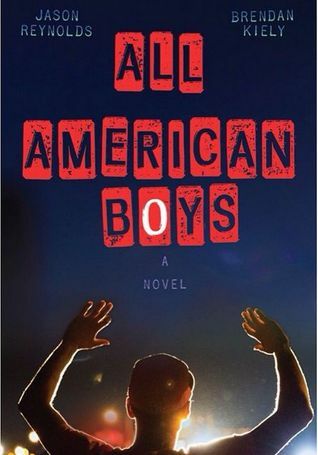 All American Boys is timely and important, and needed in our country’s attempts to talk about racial inequality. The dual narratives of Rashad (written by Jason) and Quinn (written by Brendan) is what makes this novel compelling. Each narrative could be read as a novel on it’s own, but seeing the event from two points of view just adds to the power of the narrative. The novel spans over a week timeline and we spend a section of each day with both young men. Rashad and Quinn attend the same high school, live in the same neighborhood, but do not know each other. For most of the book, Rashad is in the hospital healing from the attack, so we are mostly in his head as he starts to make sense of what happened to him. Quinn, on the other hand, gives the reader an insight into how a police officer’s family could potentially handle such a case, as well as provide the reader’s link to how the community reacts to the beating. I think the decision to not have the boys interact at all, until the final moments of the book, added to the power of both perspectives, giving the reader insight into a complex situation. I loved Jason Reynolds first two books, and feel that both he gets the teenage voice perfectly. I loved Rashad’s sense of humor and how perceptive he is to the world around him. And that is why in the moments where he tries to make sense of the beating, that my heart broke for him the most. Rashad’s father had given him “The Talk” and Rashad prided himself on being able to read situations, but yet, he is severely by a cop who couldn’t accurately read his surroundings. Rashad believed, like so many, that if he did what was right all the time, nothing bad could happen. Because of the beating, his world is thrown out of whack and he has to work within himself to try to make it right again. He is able to lean on his mother, his older brother and his friends, but I feel that his relationship with his nurse is the one that helps him the most. Everyone that loves him comes from a place of defending Rashad, but his nurse Clarissa, sees him for what he is – a confused young victim of a crime – and is the only one who treats him normally. Through the quiet of his hospital room Rashad asks himself questions and draws (he is an artist) to find his own answers to explain what happened to him, and many others. The questions Rashad asks himself are the same ones we all have, and while we cannot know all the answers, we find a way to make sense of our world, just like Rashad. I haven’t read anything by Brendan Kiely, but if All American Boys is any indication of his skills, I need to. Just like Jason, Brendan wrote a beautiful portrayal of conflicted young man in Quinn. Quinn is the oldest in his family and has taken on a more fatherly role for his little brother, but still tries to maintain some sort of teenage social life. He is placed in the tough position of being expected to side with Paul (the cop who beat Rashad), since Paul helped raise him after Quinn’s father died. However, Quinn witnessed the beating and was greatly disturbed by it. Through that experience, he begins to question all that he knows and slowly comes to an awakening of racial inequality in his neighborhood. Quinn initially believes, like well meaning folk, that he shouldn’t speak out because he feels he doesn’t have the right, but eventually realizes that by not speaking out, he only continues an unequal system. He has to make the decision to speak out against his family and friends, which is tough to do at any age, let alone when one is a teenager and your peers are your world. Quinn has to face hard truths in the novel, and like all of us do at some point, must decide how to take action. It’s an awakening to the large ugly of the world, and Quinn’s journey is a beautiful one to experience. As you can tell, I loved this novel. I think everyone, and I mean EVERYONE, should read it. I also think everyone should talk about it and then really think about the meaning behind the #BlackLivesMatter movement, think about systematic racism & police brutality, and how we can all work together to change our world. All American Boys is not only a novel that gets at the heart of the #BlackLivesMatter movement, but gets at the heart at how we can be compassionate human beings. It is a protest novel of its time, and will survive as a timely reminder for future generations of where our society once was, if we can heal the wounds that racism has brought and move forward, together, as one. Recommendation: All American Boys is available for order now, so go buy it now and have it delivered to your residence on Sept. 29th. Or, better yet, be there when your local bookstore opens on Sept. 29th. Don’t just buy one copy; buy one for yourself and for someone else who needs to read this book. Let’s make this book debut on the New York Times Bestseller list and get people talking about it ASAP. Go!